Wall Art, including excellent paintings are provided on icccshop2013.com. 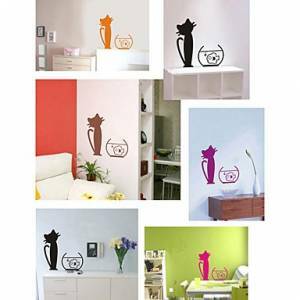 Buy Cat Eat Fish Wall Stickers (0565-gz066) online with affordable, inexpensive, cheap prices. Filling your space with art should be fun. We're a fine art publisher. We'll help you find art you love. Reduced price! $ 19.49 tax incl. 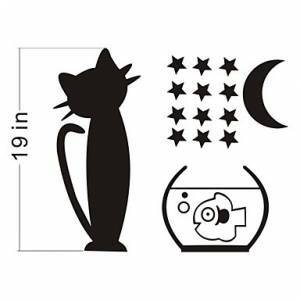 Wall stickers produces a wide range of stickers that are not only ideal for livening up spaces but also for providing simple visual interest on otherwise unadorned wall surfaces. Faux cityscapes provide a lighthearted backdrop for colorful living rooms and fake windows give a sense of extended space. Fashion design, adding fresh style to your home decor. Light material, make the shipping cost lower. Choose more, get lower price. All of our wall stickers are ready in our warehouse and can be shipped out in 7 days.